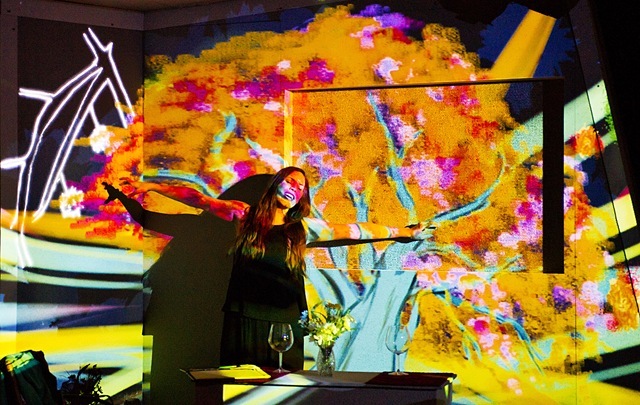 A two-person chamber opera by a South Florida-based composer had an impact beyond its intimate scale thanks to two powerhouse performances and a beautifully accomplished suite of computer projections. Fairy Tales: Songs of the Dandelion Woman, which had its premiere in early May at the SoBe Institute for the Arts in Miami Beach (and which I saw May 17), is the brainchild of SoBe founder Carson Kievman, perhaps best-known to area audiences for his residency some years back with the Florida Philharmonic. A couple years ago, Kievman saw the world premiere at SoBe of his setting of Shakespeare’s Hamlet, which he wrote for his onetime mentor, the legendary New York stage director Joseph Papp. That Hamlet was impressive for the singers that Kievman brought to the task and for its unity of dark tone, which loomed over the work like the battlements of the Danish castle. But Dandelion Woman is a good deal shorter, more accessible, and much more portable: This is a production that could easily be done in small venues anywhere modern opera is welcome. What’s needed most of all is two exemplary singers, and in soprano Meagan Brus and baritone Kenneth Mattice, Kievman had them. Kievman’s score is intense, knotty and difficult, but it suits its story line admirably. Drawn by the composer from his observations of a neighbor in Greenwich Village decades ago, it is the story of a woman’s gradual descent into madness, and the madness she then sparks in the sober bank examiner brought in to make some sense of her financial affairs. After a number of scenes of increasing strangeness, it closes with a scene (in the examiner’s imagination) straight out of a 1950s sitcom, in which the praises of a dishwasher are hymned to the accompaniment of parodistic TV music of the period. The libretto is more of a series of episodes with seemingly random word associations than a story with a clear narrative, and its ending, which is spoken, doesn’t quite work. But the opera is more akin to a song cycle, and that makes those less satisfactory elements of its prose construction less important. The opera has some kinship in a general way with Schoenberg’s Pierrot Lunaire or Erwartung, but it has distinct types of music embedded within. For much of the opera, the accompanying music is skittering, nervous and suddenly explosive, apt for a disintegrating intellect. At other times (Minetta Lane) it has a sweetly tonal feel, and overall, too, there’s a faint flavor of Bernstein-style jazz and blues (notably, A Poet Impelled by Dandelion Fuzz), a color that anchors the music in specific vocal styles rather than one continuous expression with an arc. Brus, a young Iowa-born singer who sang Ophelia in Kievman’s Hamlet, was remarkable as the Dandelion Woman. She has to enter on a high A, and a much of her part contains a treacherous amount of sudden leaps into the vocal stratosphere and jagged, spiky lines to sing. These have to alternate with more straightforward melodic contours, as well as rapid changes of dynamics, so the singer has to be in full control of her instrument at all times. Brus’s performance was a tour de force in every way, with fresh, fierce power in abundant supply, a rock-solid command of an exceedingly difficult part, and an ability to hold onto her audience through some thorny terrain. She has a large, pretty, exciting voice that is well-suited for dramatic parts, and that she is a fine exponent of contemporary music should give her some strong career momentum. She is also a good actress, believable as an ambitious job-seeker in the first scene, cheerily Stepford-like in the fake sitcom scene at the end, and compellingly lost in her own world as she drifts further away from reality. The bank examiner’s part is every bit as challenging and extravagant as the Dandelion Woman’s, and Mattice was first-rate, singing this music with forthrightness and confidence. He and Brus were good in duet as well, particularly at the end, when they were actually interacting (even if in a sitcom dream) rather giving two interior monologues at the same time. It didn’t hurt that Brus and Mattice are young, handsome people (nicely clad in Camilla Haith’s costumes) and that one liked to watch them as they made their way through this hourlong work, bringing it to an intense peak of psychological extremity. The eight-piece orchestra, behind the set and not seen until the curtain call, had no apparent difficulty playing this music, and the many spaces and silences in it demanded precision, for which much credit must go to music director Mary Adelyn Kauffman. The opera was directed by the veteran Jeffrey Marc Buchman, who made good use of Sean McClelland’s small, efficient set in the tiny Little Stage Theater, making sure each scene had a good focalpoint for the audience. One of the most impressive things about this production was its brilliant use of computer graphics. 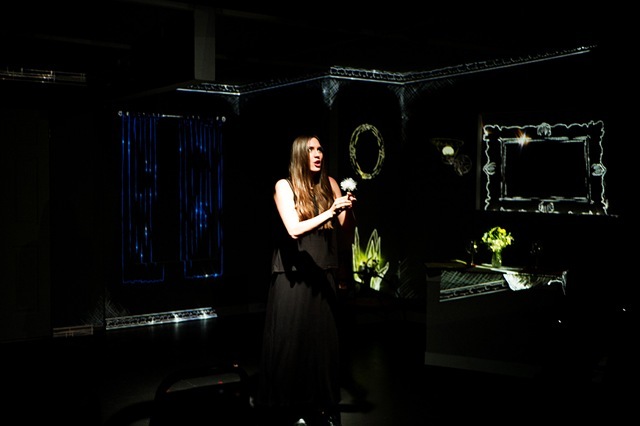 An opera like this, which deals primarily with mental states and a protagonist who is seeing things that aren’t there, is tailor-made for a technology that can make these things appear, such as a wonderful explosion of dandelions and an exciting zoom-in to the front door of an Ozzie-and-Harriet-style suburban manse. 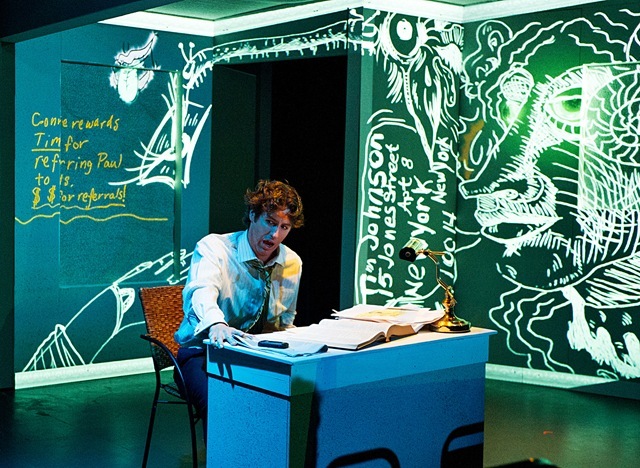 The graphics, designed by Alain Lores and tightly fit with Patrick Tennent’s lighting design, were seen throughout the opera, and they made connections that standard props and staging couldn’t have made on their own. 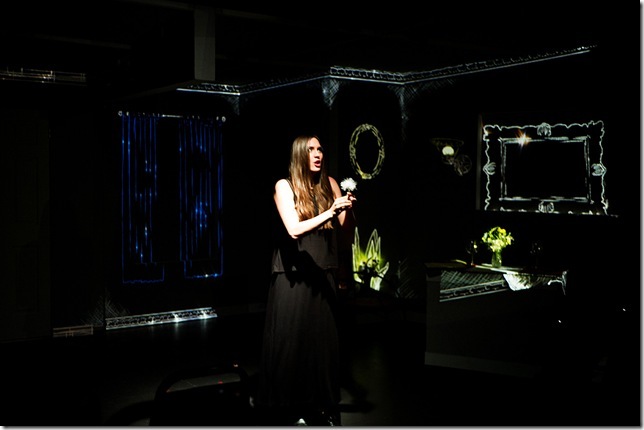 Lores’s projections were the third character in this show, a virtual Greek chorus of imagery that gave life to the Dandelion Woman’s visions and made them coherent in themselves, which was much more poignant than having them disordered. 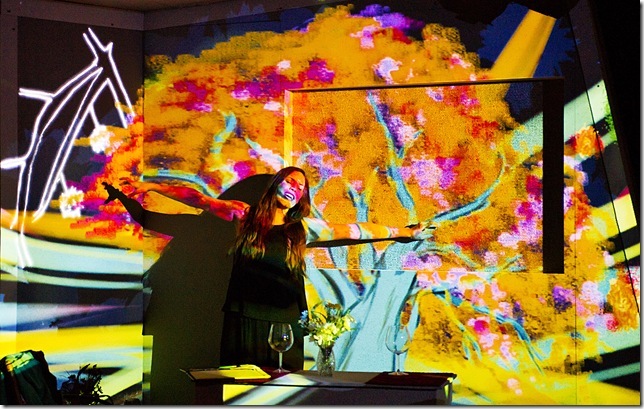 This was a most interesting night of experimental theater, with an opera of substantial modernist rigor brought to compelling life by two outstanding performances and a canny use of computer technology in an intimate space. While it is not composed in a populist style with built-in broad appeal, if the right singers and orchestral musicians can be had, it can win over curious audiences that might otherwise be intimidated by its musical language. I would think it could have a healthy life in college music circles primarily, given that it presents serious hurdles for young musicians. But it could also do well in one of the offsite opera performances that seem to be so popular these days, presented in alternate venues to theater-goers eager to be confronted by something written with such sharp intelligence, high technical skill and uncompromising integrity.